Cold air hangs on the edge of the forest Moorsfest, were the trees begin to thin and the younger saplings nearly buried in the new fallen snow. 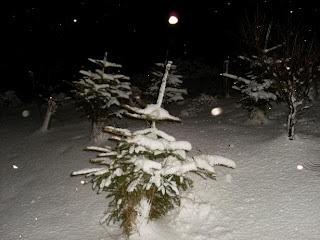 The moon shines upon the land a glaring white light, the snow glitters under it immenseness. It looks magical the snow covered earth, as Urringår guides the forest boundaries. She carries with her a hammer and an axe made in the smithies of Räasvoarbörg by Grimmodhr Troll, from long ago. Our troll was big and strong a warrior of high regard among the forest folk, her flame red hair and piercing black eyes always alert. Watched and took in what surrounded her, her gaze turned to Midvaard the ugly rowdy settlement of King Guthwyn. The inn was busy full of noise and its cacophony could be heard far and wide, across what had been a silent place during nighttime. Urringår looked upon it was disdain and contempt. She watched the place looking at it until it became just a distant blurred noise, it would seem no nocturnal attacks were going to occur this night. The folk of Midvaard were drinking! Toward the vast mountains in the north Räasvoarbörg, little green flickers began to appear like candle light. Slowly it started to rise expanding and twisting a majestic site recoiling green and blue moving above in space, lighting up the deep pendulous sky and the snowy land below. Its unending beauty spellbound our troll; she stood transfixed watching and communicating with it and all the time learning from the aurora. It guided the trolls and the other forest folk and Laarg too all linked with it in the wheel of nature. #Note# the spelling of Räasvoarbörg is an improvement on its original, it reads better and feels that it fits in with the nature of what is trying to be achieved with these stories and lyrics.